From teenagers scrapping and poking, to a useful enterprise tool, social networking has come a long way. Today, social networking isn’t just about reconnecting with old friends – it’s a powerful medium of communication for personal use, business communication and entertainment. There’re many who simply go online to access their social network. However, with the API out, several users prefer desktop clients. A web browser can be extremely distracting. For those who’re on the go, sites such as Twitter and Facebook have mobile versions that can be easily accessed on your mobile internet browser. The iPhone, of course, offers a wide range of applications for the same. 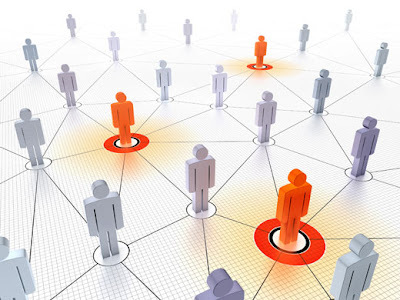 The other ways you could connect is through your web browser, your IM client, and your homepage (read iGoogle or similar). If you insist on using the web but find it too cumbersome to access, www.power.com gives you a one-stop destination through which you can access Orkut, Twitter and LinkedIn. It also allows you to access hi5 and MySpace. Desktop users would prefer something like Seesmic Desktop. The client runs on Adobe Air, and you can download it from www.seesmic.com. Though it also has a web counterpart called Seesmic Web, the Desktop client seamlessly integrates Facebook and Twitter allowing you to update and keep track of others. It allows for multiple accounts, profile views, and other time-saving features like auto-complete. While on the topic of Twitter, the other extremely popular Twitter client is TweetDeck. Again built using Adobe AIR, it also allows multiple account management, and features quite similar to Seesmic. TweetDeck also allows you to update your LinkedIn status, besides displaying local trends. Interesting functions with tools such as Power include search and automatic URL shortening. They also have their own respective photo integration that allows you to instantly upload photos and provide links. The drawback about having Twitter clients with Facebook integration is that most users link their Facebook and Twitter updates, so you usually end up seeing redundant updates. 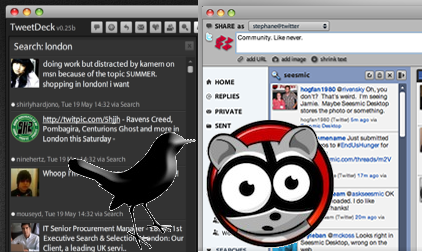 Mac users have the option of Tweetie for Mac or the Mac Lounge among other desktop clients for Twitter. Tweeple should also try out Brizzly (www.brizzly. com). It has nice features such as grouping and an interesting mute feature where you can mute those whose updates you temporarily don’t care about (for example, someone live tweeting a conference you have no interest in). You can also update Facebook from the same interface. On the desktop front, Scrapboy is quite useful. It links Orkut and Facebook (among others) and allows you to access your groups, see updates, and browse walls/scrapbooks. Apart from instant notifications, a useful stealth mode, it also has a P2P option allowing you to exchange fi les with friends. It’s a 7.6 MB download available from www.scrapboy.com. Facebook has also launched an official application called the Facebook Desktop for Adobe AIR. The good part is that it merely serves as a browser for Facebook. So you can use all of Facebook’s features without opening your browser. Another cool desktop application is the Facebook – Photo Uploader launched by Adobe, and allows you to chat and upload photos. Among Desktop Clients, however, Digsby steals the cake. For those who use social networking primarily to stay in touch, the multiple IM clients also have social networking options. Apart from integrating MSN, Yahoo!, GTalk and Facebook Chat (among others) and managing multiple email accounts, it also allows you to receive updates and send status messages on your Facebook, Twitter, MySpace and LinkedIn accounts. 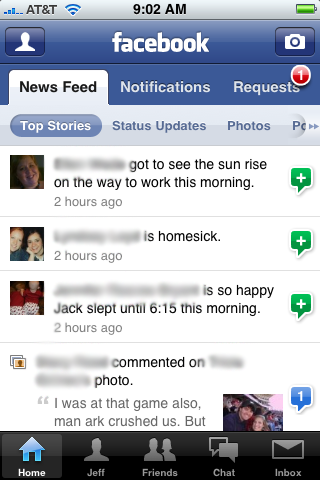 It has a real-time Newsfeed box with notifications. Digsby (www.digsby. com) is more than just an application for social networking. Its lack of features such as Lists and Search is compensated by its email and chat features. Facebook Notifier, fbQuick, Scrap Notifier are some unofficial apps that notify you. An application such as Growl for Windows or Snarl could integrate most of your networks. Of course, the above Desktop Clients for various networks are merely some among several. Depending on your level of functionality, there are many clients (especially for Twitter) out there that you could tweak and customize to suit your purpose. For several users, the amount of RAM an application consumes is a major factor while weighing its merits. 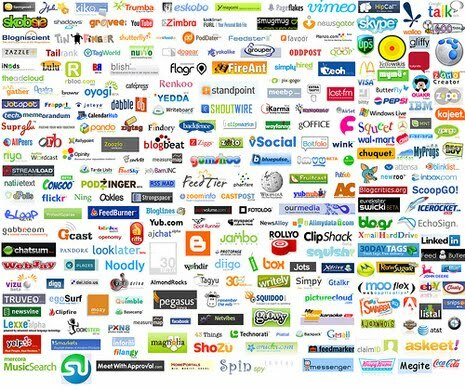 Moving over from the desktop, there’re several users who spend hours online browsing web sites. Hence, a browser add-on should fit the bill nicely. For one, there’s the Facebook Toolbar for Firefox. Developed by Facebook (http://developers.facebook.com/toolbar/), it allows you to search Facebook from anywhere and get notified of new pokes, friend requests, messages, invitation, wall posts, profile updates, photos and everything else. You can also open the Facebook Sidebar with a click of an icon to chat with those online. Possibly the most useful tool for compulsive content sharers is the option to share on Facebook the webpage you are viewing currently. For Browser add-ons, we recommend trying out either Chrome or Firefox. Though Chrome extensions are a relatively newer addition, and may not have the varied options that Firefox does, they’re worth a try. For Firefox add-ons, go to https://addons.mozilla.org/en-US/firefox/. Echofon (http://echofon.com/twitter/firefox/) is by far our favorite when it comes to browser based Twitter clients. With three windows (one for timeline, one for mentions and direct messages), it also has multiple account support. It rests at the bottom of the browser with an unread message count and has a pop-up feature for new messages. Yoono is another multiple social-networking one-stop destination that allows a sidebar extension to Firefox. It allows you to update and monitor Facebook, Twitter, and MySpace among others and has IM features allowing you to add Yahoo!, Gtalk and MSN. Check http://chrome.google.com/extensions for social networking extensions that you can plug into Google Chrome. For those who use iGoogle or the Google Desktop application, there are also widgets and gadgets that you can use to view Twitter, Facebook and other applications. Several IM clients such as Meebo and Imo.im also allow you to integrate Facebook chat and Twitter updates. Gmail has TwitterGadget (www.twittergadget.com) where you can access Twitter right from Gmail. There’s a Facebook gadget that works on iGoogle and Gmail (http://www.brianngo.net/ig/facebook.xml) (though not an official one). Orkut, being a Google product integrates quite well with Gmail with options such as Orkut birthdays and more. After browsers and desktop apps, there’s the mobile. Facebook has two mobile sites – one for normal mobile browsers (m.facebook.com) and the other for touch-enabled phones (x.facebook.com). 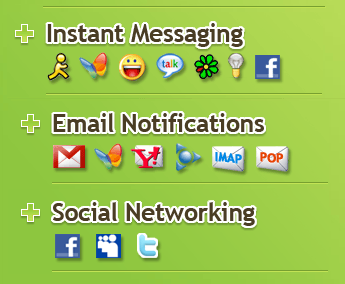 Similarly Orkut, Twitter and LinkedIn have mobile versions. The typical URL for most web sites with a mobile friendly version is m.[website].com. So you have m.twitter.com, m.orkut.com and so on. With Twitter, there are also other sites which have a better functionality when it comes to accessing them via mobile. Few examples include http://dabr.co.uk, http://m.slandr.net, and http://m.tweete.net among several others. These offer some functionality that the mobile Twitter site does not, such as the ability to disable images from loading and present links as plain text. They have standard features such as bookmark as favorite, retweet and reply. With Mobile apps, it’s a harder list to gather. There’s the standard one offered by companies themselves. An official Facebook app, for example, comes built-in with certain Nokia phones. Orkut also has a mobile application. For Twitter, there’s a huge market with loads of competition each vying for the top space. You’d have the best of choices if you owned an iPhone since most networks have an app custom built for it. There’re also several third-party applications. Most apps, however, are platform dependent. Fring seems to be a popular one across platforms. On the whole, the options out there are several. The number of ways you can access your favorite social networking site are numerous. We’d recommend trying one of every kind. If at home, use a Desktop client, if at work, use an inline browser application or a web-based offshoot, and while travelling, try both the mobile application and try accessing it via mobile browser. See which suites you the best. It’s not just about convenience and customization; it’s also a lot of fun.